You can view or subscribe to a Google calendar of events for Vermont state and local Leagues. Submitted by Vermont in January 2019. Here are some of the articles about HR1 on the League of Women Voters of the United States site. In honor of International Women's Day in 2017, the biography of women's rights pioneer Elizabeth Cady Stanton became a Google Expedition. The New York Times explores the question "What if everyone voted?" Submitted by Vermont in October 2018. Submitted by Vermont in July 2018. Submitted by Vermont in March 2018. A personal story about voting rights, a great audio listen. Recorded by The Moth, previously broadcast on the Moth Radio Hour. LWV of Vermont partners with Vermont Worker's Center to promote health care as a human right. The League of Women Voters of Vermont is partnering with the Vermont Workers' Center in their Healthcare is a Human Right Campaign. 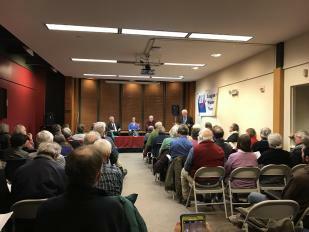 The Vermont League community access TV series presents Vermont's movers and shakers talking about issues of interest to all of us. Video is available online after broadcast.